Odds are your social media team can rattle off the number of likes, shares and other basics off the top of their noggins. Here’s the real question—what do those metrics mean? Also, how do you go beyond the basics and make those numbers work for you? Big business brain Peter Drucker says of performance, “If you can’t measure it, you can’t improve it.” That’s especially true of small business social media. You can’t just know the numbers. You’ve got to know the right numbers, understand them, use them. Only then can you leverage your social media accounts to achieve your business goals. Folks like to pore over likes/followers, shares, page views, and other data. People brag at cocktail parties, “Our Facebook page gained 250 followers this week!” or “Likes on our Instagram posts jumped 10%!” It turns out those numbers in and of themselves don’t mean much. As a smart social manager, you need to go above and beyond the basics. Figure out what the numbers are telling you. Determine how you can use those numbers to take your social performance higher. Empowered with that knowledge, your social accounts evolve beyond clever copy and pretty pictures. They become dynamic tools that boost your bottom line. I could go on all day listing all the fruitful and fascinating figures that Facebook and Instagram can reveal if you know where and how to look. Let’s look at some of the biggies. It’s not enough for people just to like your page. They need to interact with what you’re putting there. Imagine buying a book but never cracking the cover. All the work the writer put toward crafting the words is useless. Tracking Facebook and Instagram engagement tells a story. It shows if the content you’re creating is compelling people toward further action. It also tells if your stuff is being ignored. If it’s the former, great—keep up the awesome work. If it’s the latter, don’t worry! It just means it’s time to step up your game and provide better, more tantalizing content. What time is your audience on social accounts? Posting at the sweet spot—the time your customers and prospects are most likely to be plugged in—increases likelihood of engagement. Pay more attention to metrics than trends here. One day the “experts” say morning is best. The next, early evening is the hot spot. You need to dig in and find out what time is best for your audience, and your business. This is another social ingredient too many folks use mindlessly, then don’t follow through. Mindful hashtag use and tracking lead to a few good things. You can gain a better understanding of what your audience cares about. What’s more, you can bring in folks that don’t even follow you on the platform. Social media management tool HootSuite found the magic number of hashtags is 11–but again, those hashtags have to be strategic and make sense for your business. Let’s look at Instagram. You can search for which hashtags people folks are searching for. As long as the hashtag is relevant to your industry, feel free to use one of those top topics. You also can find out which hashtags people are using to discover your account. Cost per action (CPA) is the money you’re spending on, say, an ad, compared to results. Think “bang for your buck.” Too many organizations throw money at ads but don’t measure ad performance. That’s money out the window. Measuring your CPA is one way to ensure your social spending is wise and worthwhile. I’ve seen clients move from $5 per action to $0.20. It just takes targeting, honing and optimizing social content and strategy. It’s not just about saving money—it’s about forging stronger connections with people through social media. We’ve barely scratched the surface of metrics that matter. Let’s take it further. 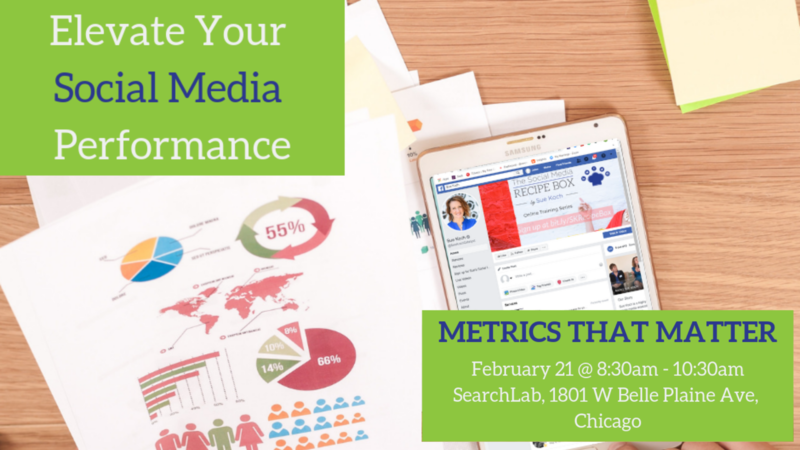 On February 21, join me at Search Lab Chicago for an intense two-hour dive into social media metrics. You’ll learn the most useful metrics, and how to put them to work for you. See you there.